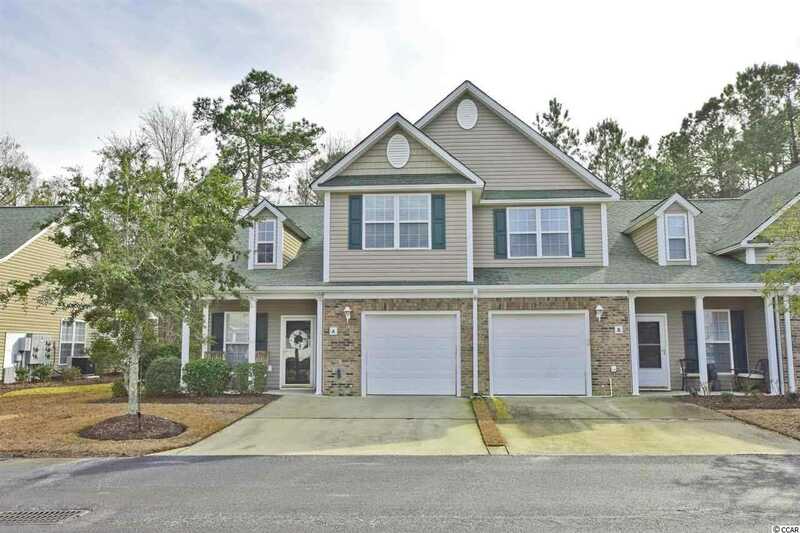 This extra large end unit townhouse in Murrells Inlet's Park West community is in pristine condition as a lightly used second home and features many upgrades and a perfect location. With 3 bedrooms, including a first floor master suite, and 2.5 bathrooms this home provides the space of a single family home with maintenance free living. With stunning hardwood cherry floors in the living area and master suite and ceramic tile in the wet areas, the entire first floor is carpet free. The high cathedral ceilings give the main living areas an open feel. The second level features two bedrooms and a full bathroom as well as a loft area that would make a perfect sitting room or office. Race track flooring was installed in the garage, so bring all of your toys. The home backs up to protected woodlands and sits across from a large pond providing great privacy. The HVAC, along with the fans and fixtures are only two years old and the paint is fresh. Park West is located off of Tournament Blvd in the International Club area of Murrells Inlet, and is just minutes from the Grand Strand to restaurants, shopping, and beaches. SchoolsClick map icons below to view information for schools near 624 Indigo Bunting Ln. #A Murrells Inlet, SC 29576.